Q: Cambodia held its sixth National Assembly Election on July 29. The Spokesperson for the Cambodian People's Party (CPP) said that the CPP has won the election. What is your comment? What is your expectation for the future development of China-Cambodia ties? A: As a good neighbor and friend to Cambodia, China sincerely congratulates Cambodia on the successful running of the sixth National Assembly Election and the CPP led by Chairman Hun Sen on winning the election. We hope that under the leadership of the forthcoming National Assembly and government, the Cambodian people will make greater achievement in their national development. In recent years, China and Cambodia have seen their Comprehensive Strategic Partnership for Cooperation developing with a sound momentum. The two countries boast frequent high-level exchanges, with mutually beneficial cooperation in various fields making steady headway, delivering tangible benefits to the two countries and people and contributing to regional peace, stability, development and prosperity. China stands ready to work with the Cambodian side to implement the important consensus reached between the two leaders, build a community of strategic significance with a shared future, and elevate China-Cambodia relations to a new height. Q: As the largest opposition party the National Rescue Party was dissolved, the international community has cast doubts on the legitimacy of the election in Cambodia. How does China view the process and outcome of this election? A: I just stated our take on Cambodia's election. The parliamentary election is Cambodia's internal affairs and a major event in the political life of the Cambodians. We express congratulations to the successful election and sincerely hope that Cambodia will maintain stability and make greater achievements in its national development. Q: First, the Taiwan side submitted a petition for the East Asian Youth Games hosting rights today. Will the Chinese mainland try to block that again in the East Asian Olympic Committee (EAOC) or take other countermeasures? Second, according to Taiwan media reports, the mainland's delegation headed to relevant APEC events, who refused to enter Taiwan due to delayed entry permit, has now returned to the mainland. Could you explain the situation? A: I would take your second question first. There has been customary practices for people from Chinese Taiwan and mainland to participate in the APEC activities hosted by each other over the years. The Taiwan side's violation of the established practices hindered the mainland delegation's participation in the Digital Innovation Forum of the APEC Business Advisory Council (ABAC) and the Taiwan side is fully to blame for the consequence. The fact and nature of this incident are very clear. The Taiwan side's attempt to confuse the public, distort the fact and shirk responsibility with relevant remarks is doomed to fail. We hope the Chinese Taipei will earnestly reflect upon what it did and correct its wrongdoing in concrete actions. With regard to your first question, I would refer you to the competent authority. What I need to point out here is that Taiwan's participation in international activities should always abide by the one-China principle. Q: On July 28, the Election Commission of Pakistan released the official results of the National Assembly election. Imran Khan's Pakistan Tehreek-e-Insaf (PTI), or Pakistan Movement for Justice, emerged as the largest single party in the election, winning 115 out of 270 seats. What is your comment on the result of the election ? A: Pakistan's election went smoothly to a successful conclusion. China welcomes that and congratulates the PTI led by Imran Khan on its success. We stand ready to work with the new Pakistani government to elevate China-Pakistan all-weather Strategic Partnership of Cooperation to a new level. Q: The "BRICS Plus" dialogue was held in Johannesburg, South Africa on July 27. How do you comment on this dialogue? What is so special about it? A: The "BRICS Plus" dialogue concluded successfully in Johannesburg, South Africa on July 27. The BRICS Summit was convened in Africa again after a lapse of five years, which gathered together leaders from Africa and emerging markets and developing countries in other region to discuss international development and cooperation, as well as the important cause of South-South cooperation. It is of great significance in that it offered an opportunity for BRICS and African countries to comprehensively deepen partnership, as well as for BRICS and relevant parties to jointly build a new type of international relations and a community with a shared future for mankind. The BRICS cooperation has been honoring the BRICS spirit of openness, inclusiveness and win-win cooperation since its inception. The "BRICS Plus" approach was put forward at last year's Xiamen Summit when China was the BRICS chair and the first Dialogue of Emerging Markets and Developing Countries was held during the occasion. This year's Johannesburg Summit continued with this model, bringing together more than 20 leaders and their representatives from Africa and other emerging markets and developing countries to participate in the "BRICS Plus" dialogue. The BRICS' broadening of its "circle of friends" is indicative of the popularity the "BRICS Plus" cooperation approach enjoys and its influence and appeal. President Xi Jinping made an important speech at this dialogue, stressing the importance to expand "BRICS Plus" cooperation, jointly deepen mutually beneficial partnership, explore new driving force, create favorable external environment, and build a new type of international relations. President Xi also pointed out that no matter how the international situation may evolve, China will adhere to its African policy backed by concepts of sincerity, real results, affinity and good faith, uphold justice while pursuing shared benefits, and support Africa in pursuing development and rejuvenation. 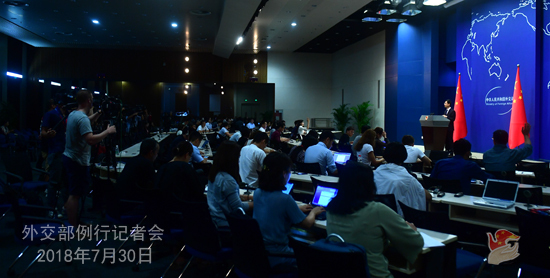 President Xi's remarks were met with enthusiastic response. All parties expressed their support to institutionalizing the "BRICS Plus" cooperation approach, building wide-ranging partnership for development, and promoting South-South cooperation. Under the current circumstances with the challenges of rising unilateralism and protectionism, all parties believe in the need to strengthen solidarity and cooperation between emerging markets and developing countries and jointly oppose unilateralism and protectionism, so as to gain inclusive growth, sustainable development and bring benefits to all. 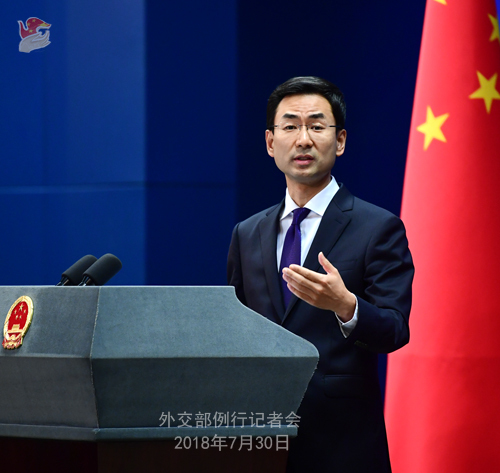 China looks forward to working with all relevant parties to deepen partnership for development between BRICS and African countries, enhance practical cooperation in various fields, contribute to the implementation of Agenda 2063 of the African Union and thus enable Africa, an ancient continent, to gain strong vitality. Meanwhile, we will continue to promote and expand cooperation between BRICS and other emerging markets and developing countries, ensure continuity in format, form a strong force safeguarding common interests and boosting shared development, and further elevate South-South cooperation to new heights. Q: The Malaysian government has just released a report on missing Malaysia Airlines flight MH370. They had no conclusion about what happened aboard the plane. I don't think that the relatives of these missing passengers will find this report satisfactory. What is the Foreign Ministry's comment on the report? A:We have been closely following the relevant development of this case. We hope that all relevant parties could maintain close communication and collaboration and properly handle follow-up matters. Q: The rescue vessel "Nanhaijiu 115" of the Nanhai Rescue Bureau of the Ministry of Transport has been stationed in the Nansha Islands to help vessels in distress and provide various maritime rescue services. Could you give us more details? A: Recently the Chinese side dispatched the professional maritime rescue vessel "Nanhaijiu 115" to the Nansha Islands on standby mission. This is one of China's most advanced rescue vessels, equipped with facilities for search and rescue, first aid, emergency towing, maritime fire-fighting, oil spill cleansing, hatch-battening and leak-stopping and underwater rescue, featuring distinctive adaptability and responsiveness in maritime emergencies. As we stressed on many occasions, China's constructions in the Nansha Islands aim to improve the living conditions of the personnel stationed there and address maritime security threats. Also, the enhanced civilian construction is designed to provide more civil and international public services to this region. There is nothing more important than human life and rescue at sea shall not be ignored. As the biggest littoral state of the South China Sea, China is honoring its obligations and commitments with concrete actions. We also hope that countries in this region will join hands to promote maritime rescue cooperation and bring benefits to people of all countries. Q: Firstly, does China have a view on how free and fair elections were? Secondly, what does China make of possible US responsive visa restrictions and EU possible responsive sanctions with regard to how this election was run? A: I have just answered similar questions. The National Assembly election is Cambodia's domestic affairs. China sincerely congratulates Cambodia on the successful running of the sixth National Assembly Election and the CPP led by Chairman Hun Sen on winning the election. We hope that under the leadership of the forthcoming National Assembly and government, the Cambodian people will make greater achievement in their national development. Meanwhile, we also hope that the international community could play a constructive role in helping Cambodia maintain stability and achieve development. After the press conference, the following question is raised: The Vietnamese government has allowed some Taiwan businessmen to hang the so-called "blue sky-white sun" flag in their factories due to their worries over security. What's your comment? A: There is only one China in the world and Taiwan is part of China. 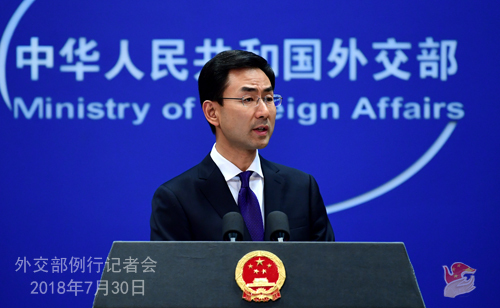 China firmly opposes all forms of "Taiwan independence" separatist activities and has lodged stern representations with Vietnam. The Vietnamese side has ordered relevant enterprises to rectify their wrongdoings.